Hey everybody!! I'll be hosting your Weekly Wednesday Stash Busting Challenge for the 28-4-28 Event. First up, if you couldn't tell from my layout, is BUTTONS! I have 1000s of them it seems. This page with approx 195 buttons did not make a noticeable dent in my collection. Although, now I need more mini glue dots. ha!!! Here are some older pages where I used a bunch of buttons. 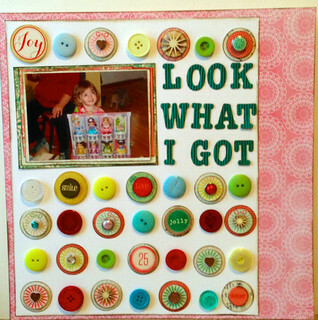 I love this one...it's a scraplift from a layout on the Studio Calico blog (there's a link in the description box in the gallery) - I layered all kinds of things on the circles but buttons are perfect. These two just have simple button borders but I think they make an impact. Love how you use those buttons! I had buttons as my item to use for the January Bonus challenge. I used some, but I need to do a page like yours to REALLY make a dent. Thanks!! I'm embarrassed to say, this didn't make a dent. 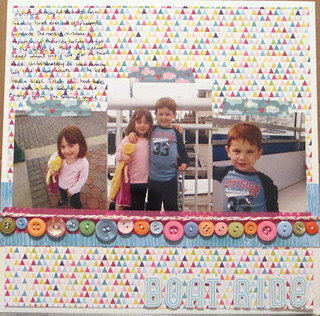 christinec68 I love your layout examples! I love buttons. I don't have a ton of them, but I am loving the way you used them here. The button rainbow is wonderful. And the button border is fun too. I'm sure I can come up with something for this challenge. What are you using for an adhesive? Or are you sewing them all in place? I use buttons quite a bit and I like Zots to adhere them. I just stuck a bunch down with Glossy Accents. Just put a drop on the page where I wanted the button, then nestled the button in where I wanted it. I like using the liquid glue with larger thicker embellishments b/c I can wiggle the piece around until it is exactly where I want it. msliz I think one of the reasons I have not used many buttons is because I used to think I had to sew them on, and that was a pain, especially if they were one of the last things on a LO, and the other layers were in danger of falling off. Now I often thread twine through the holes so they don't look too much like scary eyes, but I figured out a way not to worry about that with the page I have drying on my scrap counter. Here is my page. Used the border route. 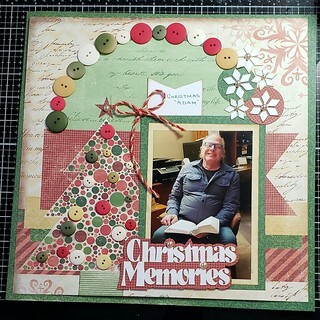 I will use a few buttons on the facing page, but wanted to get this one finished and posted b/c it also meets today's Scrap Happy LOAD challenge. (They asked for a new or not-used-lately technique, so I wrote a title word with wire). Thanks, christinec68 for getting me to pull out that button tub again. Oh yeah, and while I was looking for the jig, I discovered even MORE buttons in a drawer. I think they multiply when we are not looking! Great challenge! My buttons are put away, but I have some really nice ones from "that era". I will dig them out! Love your layouts! I love the buttons on the big circle grammadee. I might have to scraplift that idea. Oh, this was very fun to do. Not many points, but really fun. Thanks for the challenge christinec68! nylene, those buttons are the PERFECT colours. They make such a cool subtle border! This looks great!!! I love all the colors...perfect for your page. The wire word is really cool! I recently saw that wire jig tool thing somewhere and was tempted. Oh, this was very fun to do. Not many points, but really fun. Thanks for the challenge christinec68 ! This is soooo pretty!! 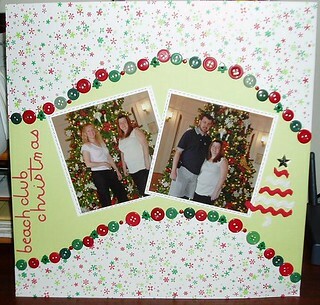 I love the foliage you added to the page and the button border is a great shelf for the photo. Thanks for doing my challenge! msliz - I used glue dots. Almost a whole box of glue dots. ha! 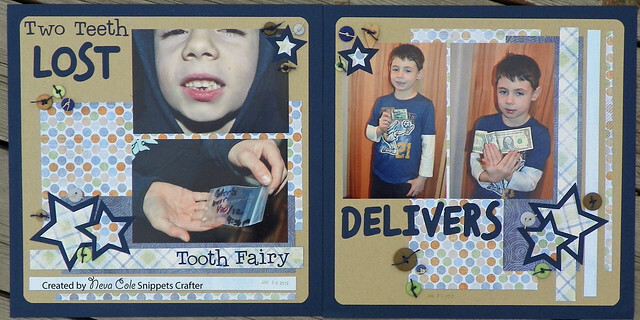 kitbop - I can't wait to see what you make. nylene I love your layout. 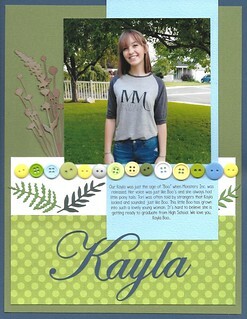 The color combo of the blues and greens, the foliage, and the buttons are perfect. Yes, very nice colors, nylene. Seems lifting worthy. msliz I love the vintagey buttons! They compliment this layout perfectly. Here's mine. I love buttons. Love it!! I like how you threaded the buttons and layered them over circles - it adds so much more dinemsion! This is fun!! I love the bright colors and the stitching!! That pic is great too! 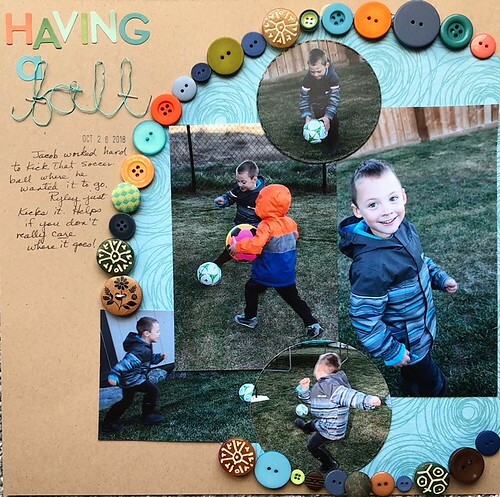 Thank you christinec68 for the reminder to use buttons. I was all finished with this LO, but thought it was missing "something." Then I saw grammadee's LO with the buttons on the circle & it was an Ah-Ha moment. 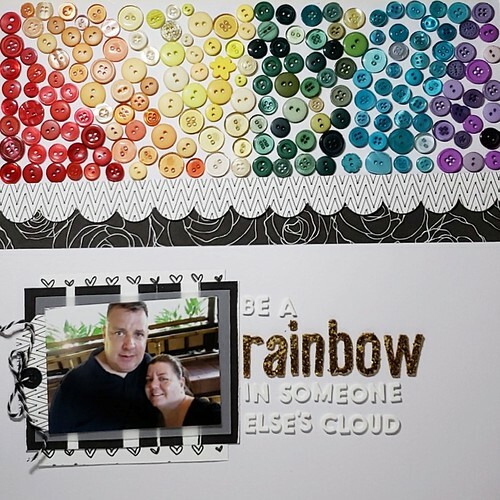 Thank you christinec68 for the reminder to use buttons. I was all finished with this LO, but thought it was missing "something." Then I saw grammadee 's LO with the buttons on the circle & it was an Ah-Ha moment. I love how you have button ornaments!! Great page!! Thanks for doing my challenge! Lisa, this is so pretty!! I love the button placement! I think I have a burlap flower like that..you inspired me to pull it out. Thanks for doing my challenge! 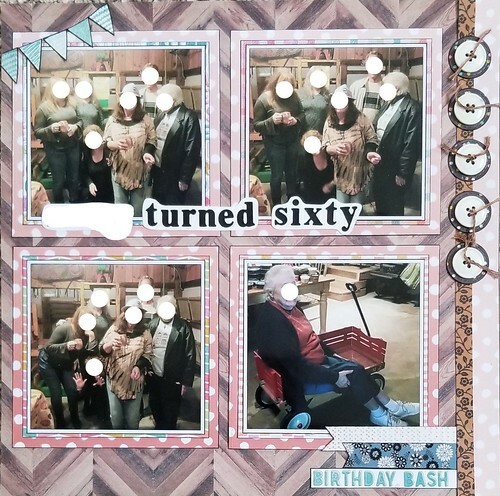 msliz , Beautiful Birthday page! I love the banner and the buttons and the little flags at the bottom. 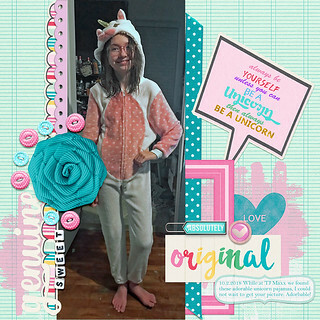 christinec68, your older pages all rock! I've loved the different looks you've achieved using buttons. I like that these challenges are making use things I might not have thought of using! Cute layout!! I love the title! Nice button work.. I like how you threaded them too!